Extra faithful replication of the original Pomodoro technique. Open-source Pomodoro timer made in Electron that faithfully replicates the original technique, made in procrastination by Jordan Peters (Rollersteaam). Credits to redmusic for banner and logo art. Drag clock numbers to set in place the set timings, and hear each click along the way. By initiating every session with a physical act, focus and flow is created through the visual and audio cues as your session has an increased sense of purpose. You may also choose to set target focuses for a block of work to determine your specific tasks. Timer completion cues and drones, as well as an optional ticking of a timer each play their part in making a pretty &apos;alive&apos; timer. This version is a major quality-of-life adjustment to Chronobreak as I&apos;ve used it personally over the last 6 months, as well as reading some feedback online about the app itself. The timer will now automatically pop up (or at least try to) on completion of a phase. The timer will now change UI when it&apos;s active. 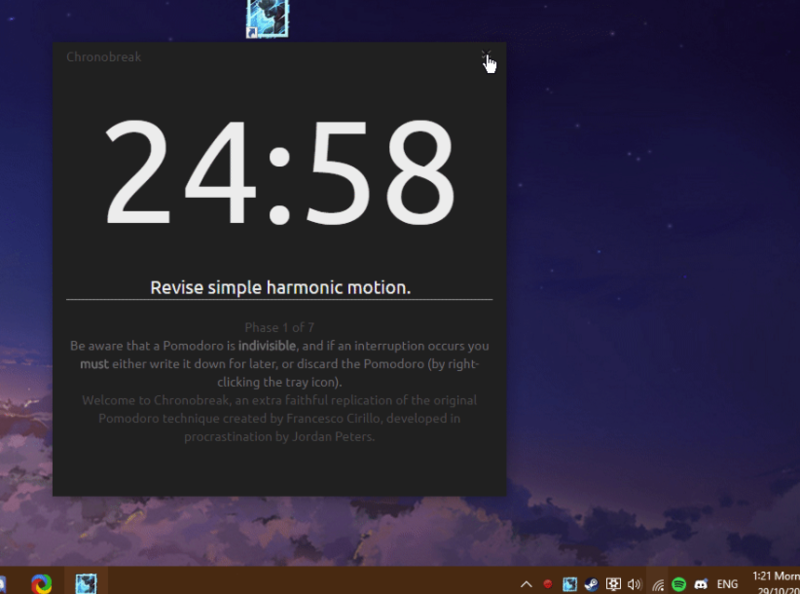 A chime will now play when a timer has been activated. The appearance of the right-click tray menu has been changed so it&apos;s more difficult to accidently discard a pomodoro. Work phase completion song has been changed because of how annoying it was before. Tick tock sound is now turned off by default. No need to turn it off each time you launch Chronobreak. Updated showcase gif to show new changes. Pomodoro completion music has been turned down a good amount (8db) and remastered to account for the weird bass distortion. Corrected text about how much work was accomplished in a session. Changed some text on &apos;Small Break&apos; phase to offer more helpful suggestions. Go to the Releases tab and download the latest version&apos;s .zip archive. Unzip it and run the &apos;Chronobreak&apos; shortcut. I would absolutely love for you to iterate on my design and improve it. By forking this project, you get your own copy of the latest version&apos;s files where you can make changes. You can then choose to make a pull request to merge those new changes. When I verify them, they&apos;ll be added officially to this project and you&apos;ll be shown as a Contributor, as well as being credited by me. redmusic - Creating the new logo and banner art!